Please follow the links to select which options best suits your needs. Follow these instructions to forward your NMSU Outlook 365 email to one external account. 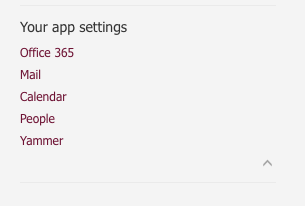 Log into your myNMSU account and select the Office 365 (Email) link from the Launchpad menu. The Mail link will redirect you to your Outlook mailbox. Here, select the Settings gear at the top of the page, revealing the Settings menu. At the bottom of this menu, under the subheading Your app settings, select the link entitled Mail. This Mail link will redirect you to the Options page, displaying multiple mail menus. Make sure the Accounts menu is expanded; if not click on the gray arrow to the left of the menu name. 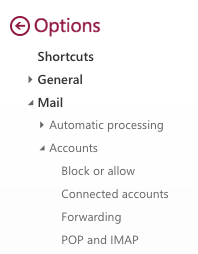 Within the Accounts menu, select Forwarding. The Forwarding window will open displaying your forwarding options. 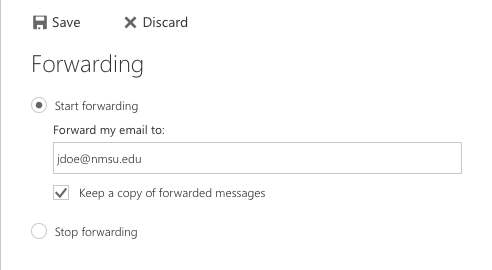 To start forwarding, select the Start forwarding option. Then enter the email address of the email account where you would like to receive your NMSU emails. 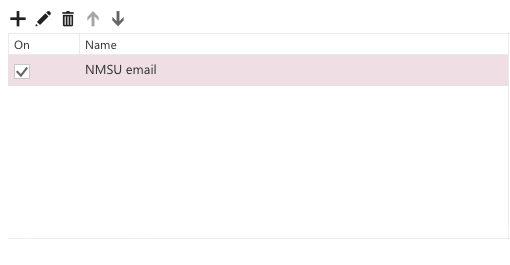 If you would like to retain a copy of your forwarded emails in your Office 365 account, make sure to check the box next to Keep a copy of forwarded messages. 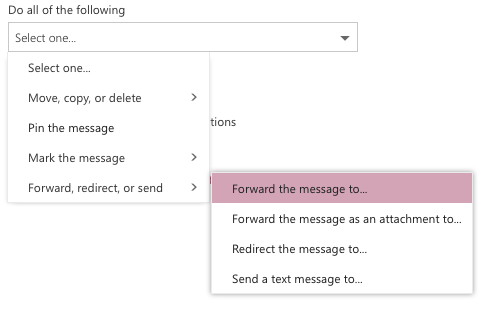 Note: If you choose to retain a copy of your forwarded emails in your Outlook 365 account, make sure that you periodically delete these emails. Once your information is entered, select the save button at the top of the window. Your NMSU Outlook 365 email will now be forwarded to the account entered in step 5. If you would like to stop forwarding, complete steps 1-4, selecting Stop forwarding during step 5 before selecting the save button again. Follow these instructions to forward your NMSU Outlook 365 email to multiple external accounts. This Mail link will redirect you to the Options page, displaying multiple mail menus. Make sure the Automatic processing menu is expanded; if not click on the gray arrow to the left of the menu name. 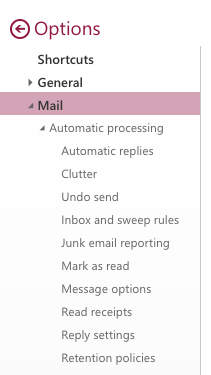 Within the Automatic processing menu, select Inbox and sweep rules. 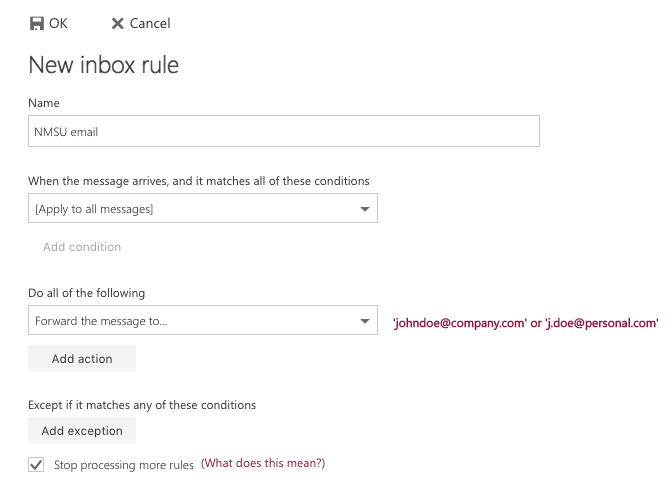 The Inbox rules and Sweep rules window will appear showing your Inbox rules at the top of the page. To forward your NMSU Outlook emails to multiple accounts, select the plus sign listed beneath the Inbox rules heading. This option will open another window containing your contacts. If the email addresses you would like your NMSU emails forwarded to is saved to your contacts, select the plus sign next to the contact. If the email addresses are not saved to your contacts, type the email addresses next to the Forward the message to... prompt. Separate addresses with a semicolon (;) and click save. This will return you to the New inbox rule page. Review your settings and click OK at the top of the window. You will be returned to the Inbox rules page. Here, you will see your new inbox rule displayed meaning your new Inbox rule is now in effect. To edit your inbox rule, make sure the rule you would like to edit is highlighted and select the pencil symbol that appears next to the plus sign. Repeat steps 1-5. Once on the Inbox rules page, select the forwarding account you would like to remove and click the trash can at the top of the list.